i was looking through an electronic folder on the computer of old pictures and came across photos from the first day we brought leko home. oh my goodness, my heart burst looking back at how tiny he was!!! it's hard to remember that he was actually once that small! i couldn't resist sharing this picture. even though it's a little blurry i love it so much. 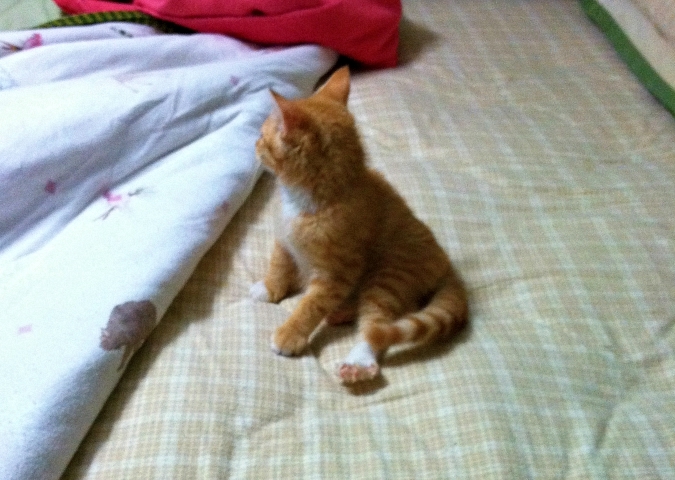 it was the first time he sat in our bed and he was so small compared to the bed. i'm so happy that seven years later he still loves to cuddle up in bed with us. what a cutie! Oh he is so cute. Day one he claimed the bed. How adorable.